If you’ve studied this “2028 END” ministry, you now know God secretly hid His Master Plan (and the timing of it!) in His 7 Day Creation week story. Subsequently, every 7 day week that passes is a mini-glimpse, for us, of God’s overall plan for Earth. 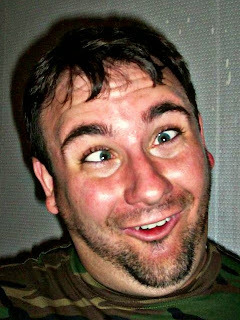 Well, about a week ago, while lying in my bed, God showed me another wonderful thing … His Master Plan (and the timing of it) not only plays out in each passing week, but it ALSO plays out in EACH passing year! Prepare to be amazed! The Jews believe the first day of Creation was on Rosh Hashanah (Feast of Trumpets) which occurs each year around, or on, the fall equinox. And, in fact, in the year AD 2028 Rosh Hashanah is scheduled to occur right on the fall equinox, around September 21-23. 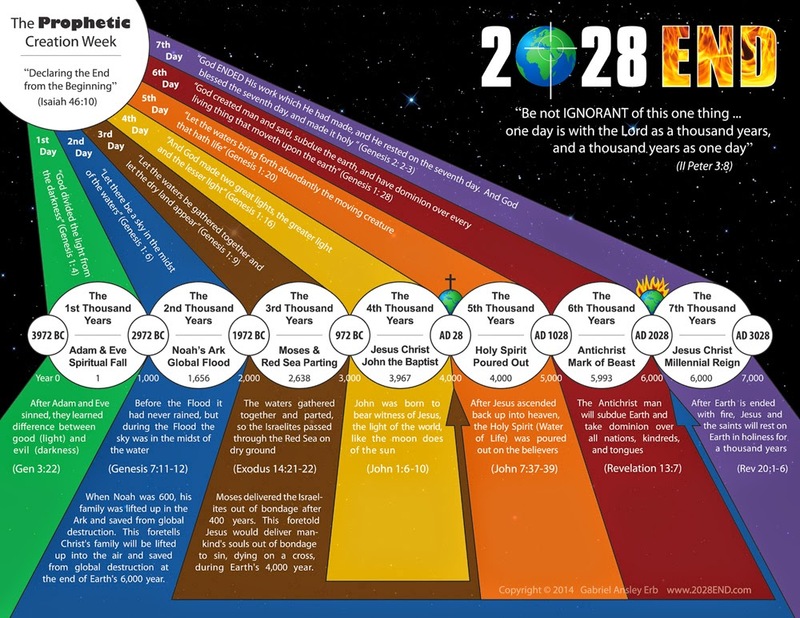 Consequently, we here at “2028 END” believe God had/has planned for EXACTLY 6,000 years to transpire between His Creation of Earth on Rosh Hashanah 3972 BC and the return of His son Jesus Christ to Earth on Rosh Hashanah AD 2028. How then does God’s Master Plan (and the timing of it) play out in each passing year since the Creation of the world? It’s in the fact that a year has 4 distinct seasons, each representing a 1,500 year period, for a total of 6,000 years. And what season BEGINS at the fall equinox? FALL! 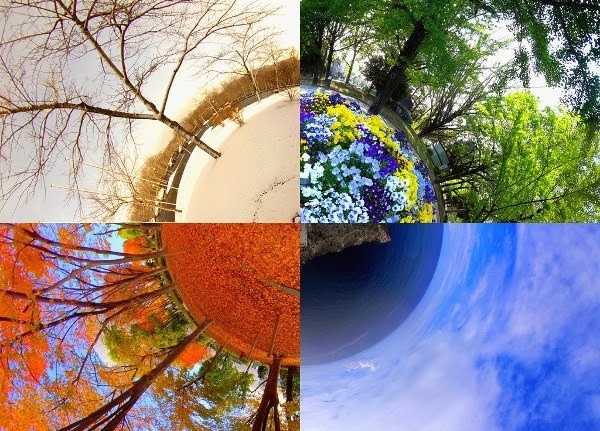 Therefore, the season of Fall will represent Earth from 0 - 1,500 years old, winter from 1,500 - 3,000 years old, spring from 3,000 - 4,500 years old, and summer from 4,500 – 6,000 years old. And what was the biggest event of Earth’s first 1,500 years? The spiritual FALL of Satan and mankind! Even as the leaves lose their life and die, falling to the ground in the season of fall, so too Satan and his angels (demons) fell from heaven and mankind’s souls lost their life and died during this time period in God’s Master Plan. And even as death continues to reign in the cold, dark season of winter, so too mankind’s souls were to remain dead to sin during years 1,500 to 3,000. But even from before the creation of the world God planned to have the Messiah, Christ Jesus, come to Earth during years 3,967 - 4,000, right in the heart of the season of spring. And so just like in the spring season each year we bury seeds in the ground to later bring forth fruit, so too Jesus was buried in the ground, becoming the fulfillment of God’s seed promise to Abraham whereby millions of human souls will reap eternal life one day! And during the season of summer the crop ripens getting ready for the final harvest at the end of summer. So too, at the time of Christ’s return at the end of Earth’s 6,000 year, the righteous (wheat) will be gathered into the air (barn) to be saved, while the unrighteous (tares) will be left to be burned! Yes, truly, God’s Master Plan (and the timing of it!) for planet Earth plays out in each passing year! Approximately 696 Weeks (Sabbaths) Remaining Till Christ's Return!